Get away from the crowds and tourism traps to experience New Zealand’s most personal cultural tourism setting: a living, breathing family home, located in a Māori village settlement our people have inhabited for over 1000 years. We Get You Deep Inside The Culture In This Personal & Moving Experience That Will Connect You Forever To Our Land, Our Traditions And Our People. If You Are A Soul-Searching Traveller Seeking The Ultimate NZ Souvenir, Toi Moko Is The Only Experience For You. 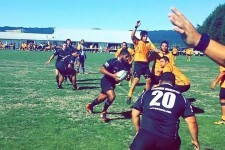 Catch NATIV ConnectioNZ On Maori TV’s Pumanawa Series! The Weather Was Mint, The Fish Were Biting & We Did Our Best To Put On The Rest! 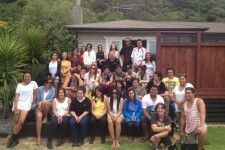 Click On The Link Above For An Entertaining Insight Into NATIVConnectioNZ’s Unique Range Of Exclusive Maori Experiences In The Heart Of New Zealand’s Sunshine Capital. 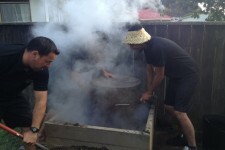 Book Your Exclusive Maori Experience Today! Join us for a once-in-a-lifetime opportunity to live as the locals do while exploring traditional and contemporary facets of our living indigenous culture. No scripts, no performance, just 100% authentic, genuine and personal interactions with our people and our land. Get NATIV today and see the real New Zealand. Our aim is to introduce you to Māori culture through captivating storytelling, unique local experiences and delicious cultural cuisine. We keep group numbers small to ensure we are able to interact with our guests on a personal level to deliver the ultimate immersion into New Zealand’s indigenous culture. Whakatāne is New Zealand’s longest continually occupied settlement and we are the descendents of the town’s very first inhabitants. 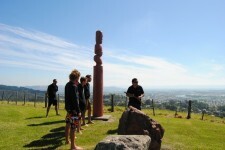 Walk with us to the most sacred sites of our ancestors as we share our traditional and contemporary Māori legends, history & customs to give you a unique insight into the Māori world.